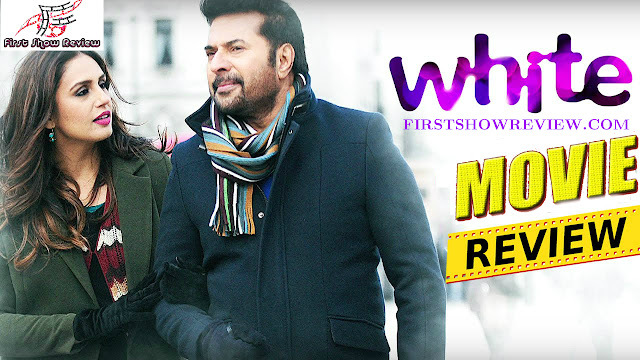 Mammootty starring White reached theater on July 29. As his movie ‘Kasaba’ is running very successful in theaters. White is about this girl Roshini. She is a techie and gets an on-site project in London. After her arrival there she meets this money man with arrogance, Prakash Roy. How this meeting changes her life and who exactly is Prakash Roy is what this movie telling us. it’s the drama that annoys you to the core. Even with such awkward pronunciations of Malayalam words, most of the characters are speaking this printed Malayalam language. May be the makers sensed that problem and tried to add all those dialogues were the characters are sort of making fun of the philosophy in dialogues. But still that doesn’t save the movie from being dull. One more awkward part is in the poor characterization. Roshini is way too quick to judge a stranger and Prakash’s arrogance also doesn’t have sensible explanation. All these factors somewhat makes the key moments in the movie look really silly. Prakash Roy is safe in the hands of Mammootty. More than an emotional pitching of the character, the movie is much interested in presenting him in this stylish Avatar. Huma Qureshi’s expressions are pretty good. But much like NeeNa, Raveena Ravi’s out of sync dubbing and unconvincing pronunciation of Malayalam words affects the performance. Shankar Ramakrishnan was okay. There aren’t any other main characters in the movie other than our hero and heroine. Uday Ananthan who has made movies like Mrithyunjayam and Pranayakalam in the past is still stuck in that cheesy way of storytelling. We could sense the formula the movie is trying to follow while we watch the movie. And there are phases in the screenplay which are very hard to digest. Nothing substantial happens between the protagonists to convert the relationship into that deep understanding and the scenes they have used to show the bonding of the two look quite formulaic. A few one liners said by Prakash Roy sounded good on a quote level. Cinematography is average and the edits were poor. Background score becomes excessive at many areas while the music from Rahul Raj was pleasing. Still London is a bad luck for Malayalam movies. The Directory still in the same streamline of his past movies. White for its 150 minutes of run time is tedious and uninteresting. You could sense a sort of hastiness in the way the movie has been conceived. And along with that the lack of realism drags it further back.